Welcome Weekend is the official kick-off to the Minot State academic year and the second part of the new student experience at Minot State. Events during the day will serve as an opportunity for you to explore the vast array of resources available at Minot State, including academic, cultural, social, athletic and community service programs. Most of all, you will have the chance to meet your Minot State Community. Whether you are a commuter or residential student, we look forward to seeing you at all of the events! Social events continue through the first week of classes. Guests will be welcome to attend select events. Students will be sent information regarding signing up for a Welcome Weekend group via email. Students, at that time, will be able to select a service site activity, which will place them in their Welcome Weekend group. In early August, your Welcome Weekend leader will contact you with a Welcome Weekend schedule of events, as well as a schedule of activities for your specific group. 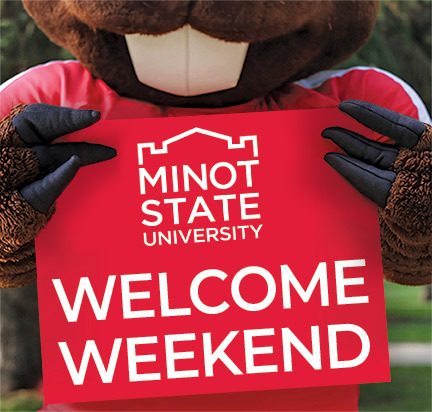 Welcome Weekend, like New Student Orientation, is a way for ALL new Minot State students to learn about resources, expectations of higher education, and a way to meet new people. This is a mandatory event for all new first-year students and is highly encouraged for new transfer students. Please make every attempt to attend your group’s scheduled events. Welcome Week(end) begins with Move-in and Student Convocation on Friday, August 23rd and ends on August 26th. Classes begin at 4 p.m. on August 26th. Create opportunities to investigate their intellectual and educational goals. Explore curricular and co-curricular activities, resources, and services that support a successful transition to Minot State. Engage in interactions designed to build and maintain relationships with students, faculty and staff. Encourage challenging and supportive dialogues that promote self-reflection, critical thinking and appreciation of diversity. Be provided with an understanding of campus culture and the culture of the Minot community. Your new Student fee supports Welcome Weekend activities.